How do you spend a typical morning? For a sea otter it may mean a breakfast of nutritious clams. Sharp teeth help rip apart the meat of the clam. Swimming on its back, a sea otter's belly serves as a perfect table. A bath may come after breakfast. Grooming is the way otters force air bubbles next to their skin. These air bubbles act as insulation for warmth and provide buoyancy. Just the thing that's called for, before wrapping up in a blanket of kelp and joining others for a mid-morning nap. 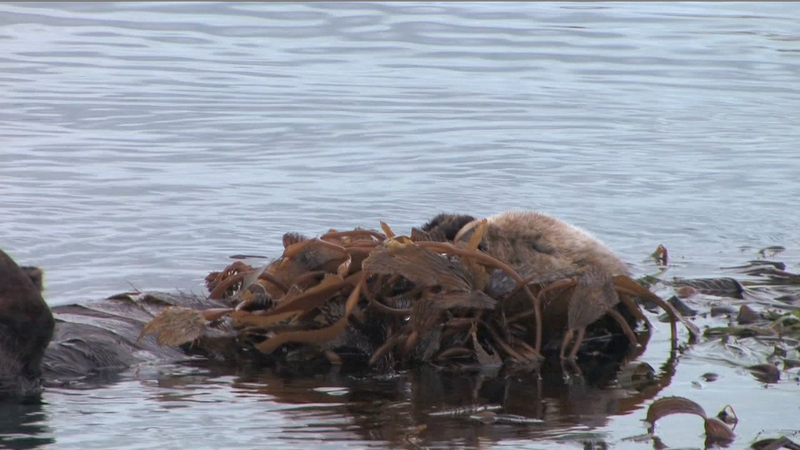 The blanket of seaweed will keep them from drifting too far away while they sleep. Seaweeds such as kelp are found up and down the California coastline and are vitally important to the animals that make their homes here, providing food, shelter, and protection. Seaweeds are important to people, too. Within a plant like kelp is found a smooth, creamy substance that's extracted and found in many products we all use every day. Listed in the ingredients as carrageenan or agar, its these derivatives of kelp that keep the chocolate in your chocolate milk from settling to the bottom, keeps your toothpaste nice and creamy when you put it on your teeth, and makes that lipstick go on nice and smooth. So, the next time you're drinking chocolate milk or brushing your teeth remember, you have kelp to thank!